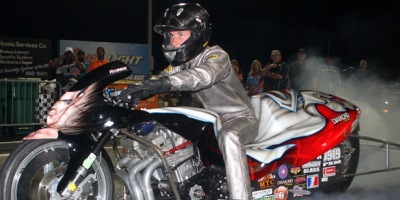 One of the most successful MIROCK no-bar racers of the last five years, young Jeremy Teasley continued to solidify his reputation as a rising star in the drag bike community with an impressive victory in Pro Extreme Motorcycle at ADRL’s Summit Racing Equipment Ohio Drags in Norwalk, Ohio, Sept. 23-24. The win came in only Teasley’s second race in the Pro Extreme/Pro Mod category. Riding Rob Hunnicutt’s “Superman” Suzuki, Teasley score the final round victory over Travis Davis with a .066, 4.040 at 176.10 mph to Davis’ .042, 4.124 at 173.58 mph.